December ended up exactly normal in terms of temperature. It was the coolest December in three years. Top temperature of 13.8° was on the 6th and lowest was -4.4° was on the 28th. The same day we recorded a grass minimum of -11.0°. Rainfall was a little above normal. Wettest day was the 9th when 29.9mm was logged. Top wind gust of 74 km/hr was recorded on the 31st as Storm Dylan passed close to the northwest of Ireland. A sharp frost at the weather station on November 17th. There were 10 days in all when the temperature dipped below zero (which is slightly more than normal). A cold end to the month ensured that the mean temperature was a little below normal. Rainfall was below normal with the wettest day being the 21st with 16.4mm of rain. It was still a little wetter than November 2016. There was no really windy days with the top gust only 51 km/hr recorded on the 23rd. On Monday October 16th the remains of Hurricane Ophelia struck Kilkenny with winds gusting to 115 km/hr. With many trees still in leaf, a large number fell throughout the county which resulted in many power outages. It was milder and drier than normal. The warmest day was the 14th when it reached a maximum of 19.0°. Coldest night was the 6th when it dipped to 1.0°. There were eight nights with ground frost. Rainfall was only 63% of normal but it was still our wettest in 3 years. Wettest day was 19th with 19.2mm. Windiest day was of course during ex-hurricane Ophelia when a gust of 115.2 km/hr was recorded. Sunday September 10th was a blustery, showery day as can be seen from this shot over the River Nore at Kilkenny Castle. The start of September was wet with average temperatures. It was colder and wetter than normal. There was only one warm day, the day of the All Ireland Hurling Final (3rd) and it reached a maximum of 24.2°. This was the highest temperature recorded anywhere in Ireland and indeed Britain during the month. The lowest air temperature was 4.5° recorded on the 18th. There were however 8 occasions when the grass thermometer dipped below zero. It was a wet month too. The wettest September in 7 years. The wettest day was the 2nd when 17.1mm was recorded. In many peoples' eye it was not a August 2017 was not a great month. Mean temperatures were almost 1° below normal. It did reach 20 C or more on 11 days, however there were no hot days with the highest temperature of the month being only 22.3° recorded on the 21st. A feature of the month was the cool nights with the minimum of 5.7° recorded on the 13th. In fact there was a touch of ground frost on the last day of the month with a grass minimum of -0.6°. Although there was a dry end to the month, it was wetter than normal with the 14th and 20th being two very wet days. High Summer, July 15th outside Kilkenny Castle. There were several nice days like this one, especially in the first half of the month. However it did turn more showery at the end. The temperature reached 25° C or more on three occasions. Mean temperatures were average but having said that it reached 20 C or more on 17 days. The warmest temperature of 25.4° was recorded on the 15th and the coldest night was on the 1st when it dipped to 5.3° with a touch of grass frost. Rainfall was a little below normal with the bulk of the rain coming in the second half of the month. The wettest day was the 20th when 14.8mm was recorded during a few thundery bursts. Top wind gust was 54 km/hr (almost a gale gust) which was recorded on the 27th. View over "The Continent" on a pleasant afternoon on the 14th of June. Just two days after that began the continental style heatwave. We had five consecutive days with maximum temperatures above 25°C. It was another mild month. The mean temperature was fractionally lower than June 2016. There was a heatwave stretching over 5 days from 17th to the 21st when maximum temperatures exceeded 25° each day. The warmest temperature day was the 19th when it reached 26.7°. It was however wetter than normal and was our wettest June since the very wet June of 2012. The wettest day was the 26th with 23.4mm of rain. The river Nore just above Green's Bridge on a fine sunny May 3rd. The start of the month was very dry. But wet days on the 12th, 18th and early on the 27th ensured that May was the first wetter than normal month since September 2016. It was a very mild month and sunny month. It was the warmest May since 2008. The warmest temperature of 23.7° was recorded on the 26th. The total rainfall was 79.7mm. The wettest day was on the 12th when 24.5mm almost 1" of rain was logged. It was a remarkably mild srping. The warmest since continuous records began in 1958. Outside of that there was one other warmer spring and that was the spring of 1893, at Kilkenny Castle. A beautiful fine spring day at Inistioge on April 8th. The cherry blossoms were in evidence as early as April 6th, following the very mild March. It was a mild month and very dry. 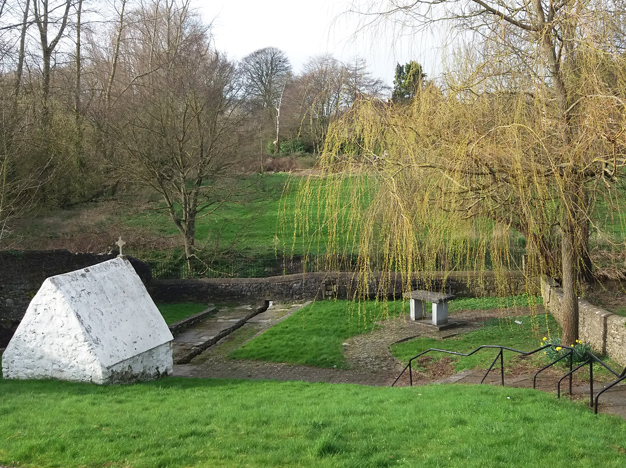 It was the driest April in Kilkenny since continuous records began (1958). Outside of that time we have to go back to 1896 to find a drier April. The total rainfall was 18.1mm and there were only 3 days with more than 1mm of rain - the 3rd, 29th and 30th. The 30th was the wettest day with 8.7mm. There were no droughts recorded despite the dry weather. It was also a mild month thanks to warmer than normal nights. Towards the end of the month there were some sharp frosts with 0.2° recorded on the 26th. It was quite a dull month however with anticyclonic conditions predominating. There was no real warm day with the top temperature being 17.0° on the 8th. After a cold, wet start to the month there was some pleasant weather in the week before St. Patrick's Day such as this bright afternoon at Kenny's Well on the 13th. The temperature peaked at 16.2° two days later. A very mild month. Almost as mild as March 2012 (the warmest March). Both the warmest temperature and coldest were recorded on the same day, the 25th, when it reached 18.0° and -0.2°. Rainfall was a little below normal. Our 6th consecutive drier than normal month.The strongest wind gust of 80 km/hr was recorded at 6pm on the 1st of the month. 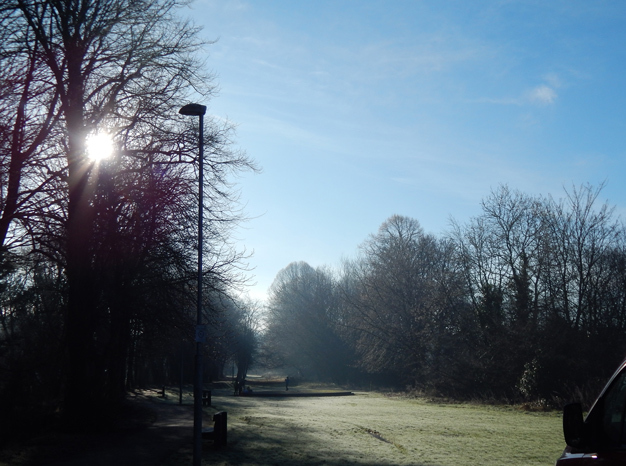 Frost clearing near the canal on a sunny morning 5th February. After a mild wet start, the weather turned cold and frosty for a time but finished again mild. It was another mild month, the mildest in 5 years. There were 9 days with air frost but this was more than compensated by 17 days when the temperature exceeded 10 °. The lowest temperature was -3.6° recorded on the 5th and the highest was 14.2° on the 21st. It was a little drier than normal and continued a run of 5 consecutive months with below normal rainfall. The highest wind gust of 85 km/hr was recorded at 5:30am on the 23rd, as Storm Doris passed over the north of Ireland. It was a dry winter with all 3 months (Dec-Feb) recording below normal rainfall. That said, it was still not quite as dry as the winter two years ago (2014/2015). The mean temperature for the winter was 6.1° which is almost 1 degree above normal. It was slightly cooler than last winter. (2015/2016). Snowmageddon 2017 outside the Old Workhouse, Callan on Friday 13th. 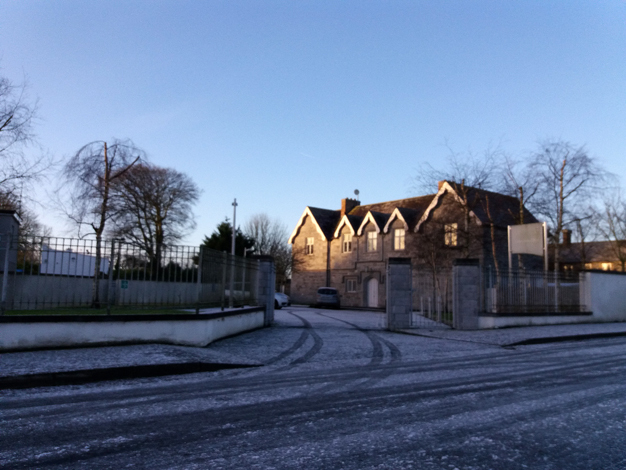 The much hyped cold snap delivered very little snow to the Kilkenny region.There were quite decent falls in mountainous parts of the southeast but alas temperatures were mostly above zero during the period. A small sprinkle of snow fell early in the morning in the Callan area gave a light dusting. Otherwise the month tended to get milder after this event. Overall it was a mild, dry month. Mean temperature was fractionally higher than Jan 2016 and it was the mildest since 2012. The lowest temperature was -4.9° on the 3rd and the highest was 12.0° on the 6th. There were many dry days, with an anticyclone over southern England holding firm. It finally gave way on the 29th and on that day and the 30th, over half the monthly rainfall total was recorded. There were few stormy periods. The highest gust of 71 km/hr was recorded just before 7am on the 9th during a squall.